I've added a step-by-step walkthrough outlining how I create tactics using this framework. Fluidity is a complex idea, and its effects on tactics are subtle and nuanced. Given the difficulty of succinctly and accurately defining it, some Football Manager players have justifiably questioned whether it should even be present in the game. While I don't share this view, I do agree that most Football Manager players don't really need to overly concern themselves with the effects of the setting. Simply, a change of fluidity will not make or break your tactical approach, and if you stick to the sort of reasonable principles of tactical design outlined in wwfan's excellent introductory guide and llama3's superb commentary on role combinations, you will have all the tools you need to be a successful manager. However, if you're interested in exploring ways to make full use of the powerful and versatile tools that FM14 provides, this project presents a new framework for understanding how the various team settings interact to promote specific behaviours on the pitch. The basic idea is that the different combinations of team mentality and fluidity settings can be interpreted in terms of telling individual players to prioritize specific responsibilities, and through this interpretation, I think fluidity can be presented in a way that more accurately reflects its impact on play. The idea of fluidity as a game mechanic for Football Manager has its roots in the Tactical Theorems & Frameworks series that preceded and informed the development of the Tactics Creator. This series incorporated a variety of different theoretical perspectives, from critical theory to Karl Popper's scientific epistemology, to approach the slider-based system of classic tactics and develop practical frameworks for tactical design. These frameworks were later refined in terms of concepts developed by the tactical historian Jonathan Wilson to form the basis of the Tactics Creator as we know it today. Since this project is largely an effort at reopening and reconsidering this dialogue from a different perspective, it inevitably addresses and assumes some degree of familiarity with Wilson's concepts, though when possible, I've made a conscious effort to explain the relevant terminology for those who are new to the debate. If you're looking for tips on applying specific tactical settings, I believe most players will find much of the advice in Section 7 immediately useful while the outlines of player responsibilities in Sections 2-6 will give you a sense of how a tactic will be organized under different fluidity/mentality combinations. Beyond that, some of the more theoretical content here may not be useful or even remotely interesting to a lot of players. Fortunately, as I noted above, a nuanced understanding of fluidity is not a prerequisite to enjoying the game, though I hope the advice and interpretations presented here will help lead to new ideas for making the game more enjoyable for everyone. Among both new and experienced Football Manager players, this core concept of the Tactics Creator remains a persistent source of confusion and misconceptions. To some extent, this is an expected consequence of the abstract nature of the idea itself. Designed to provide a coherent framework for setting positions on the infamously vague mentality slider, it operates as an abstraction of an abstraction that circumvents the ambiguity of the parts by attempting to give a clear and accessible sense to the whole. Yet, as the persistent confusion suggests, important details are still missing from the picture. The organization is there, but there is still no clear sense as to what, exactly, is being organized and how this would translate into an instruction that a manager would actually give his players. In practice, fluidity is less of a tactical concept than a managerial concept. It does not represent the style of football actually produced by the players on the pitch so much as the way in which the manager goes about getting the players to produce it. In other words, it is not the team's style or philosophy of play but the manager's style and philosophy of management. Unsurprisingly, for many players, it remains unclear how the setting actually affects their team on the pitch while debate continues over the extent to which it should actually dictate the details of tactical design. The continuing debate itself seems to be an indication that, conceptually, fluidity was not quite rooted in firm ground from the outset. While the Tactics Creator retains a simplistic and misleading emphasis on positional contributions to the various phases of play, the more nuanced analysis of recent guides and discussions reflect considerable evolution in how the theory behind the setting is being interpreted. A key aspect of this is the scope of the universalist vs. specialist distinction in modern football. This divide between tactical systems that emphasize player versatility and tactical systems that emphasize player mastery of highly specific skill sets is central to the theory underlying the idea of fluidity, but in the broader historical sense, the debate has long been settled. The universalism pioneered by Michels and Lobanovskyi has permeated tactical thinking at virtual every level of play. As Jonathan Wilson recently noted in regards to the holding midfielder, even the nominal specialists are becoming universalists to ever greater degrees. Wilson describes this as "paradoxical," but in fact, it's a natural implication of the near total demise of the overly static, positionally fixed football of bygone eras. In this sense, the match engine itself has always been a step ahead of the Tactics Creator that set out to explain it, and the all-encompassing, intertwining influence of both universalism and role theory, in which position refers primarily to a vague set of defensive responsibilities, are now the norm in both football and, moreso with FM14 than ever, Football Manager. Accordingly, fluidity has never done exactly what it says on the tin. The effects are certainly significant and crucial to coherent tactical design, but they are subtle and, more importantly, thoroughly rooted in a match engine that seeks to represent the modern game of football in which the lines between the rigid and the fluid can often be imperceptible on the pitch. This is not to say that there is no distinction between universalism and specialism in either football or Football Manager. There most certainly is, but it is a historically relative distinction that exists within a more generally universalist paradigm. The current prominence of the 4-2-3-1, in which two midfielders are withdrawn to free up a pair of attacking defenders, is an ever present reminder of this, regardless of whether that midfield pair consists of a destroyer/creator partnership or a duo of hybrid controllers. From this perspective, I think there are reasonable grounds to revisit the foundations of the fluidity setting and reconsider the theory in terms of the relatively mundane managerial instructions being theorized. In other words, in order to better refine and utilize the theory behind the setting, the particular details underlying the setting must be brought into focus. What is needed, then, is a clear, practical interpretation of what fluidity actually does within the context and vernacular of the Tactics Creator itself. The following document is an exploratory and, hopefully, elucidating attempt at accomplishing this. Using an interpretative framework called the mentality ladder, I have attempted to illustrate the practical basis upon which the concept of fluidity is based. The fundamental assumption underlying this framework is that fluidity is not, in practice, a team instruction. Rather, it represents the principle by which a set of relatively simple individual instructions are organized. Accordingly, to understand fluidity, it's important to understand how this abstract concept translates into the clearly expressed instructions given to individual players. Below, you will find four versions of the mentality ladder: one for attack duty players (excluding advanced playmakers, trequartistas and enganches), one for support duty players and playmakers, one for defend/cover/stopper duty players (excluding deep lying playmakers) and one for goalkeepers. In each case, the mentality ladder represents a set of general tactical responsibilities listed in descending order from most attacking to most defensive. These responsibilities indicate which task a player will look to carry out when occupying a different position or rung on the mentality ladder. The rung or task that a player is primarily associated with is his tactical priority. A tactical priority indicates a player's main function and responsibility within a team's specific set of tactical instructions. While the relationship between role, duty and tactical priority will be discussed in detail further on, it should be noted here that the concepts are distinct yet closely connected. Basically, a role shapes the precise manner in which a player approaches his tactical priority while duty controls his willingness to deviate it from it to join the attack. In this sense, tactical priorities are both general and responsive to other tactical settings. This reflects, as discussed in the introduction, the underlying universalism of modern tactical systems. While the names of the tasks will hopefully give you a fairly clear sense of what they involve, detailed descriptions of each have been provided in "Part VIII: Tactical Priorities in Detail." One important aspect of the mentality ladder that should be noted is the duty-based division of priorities that occurs as players assume attacking responsibilities in the opposition half. 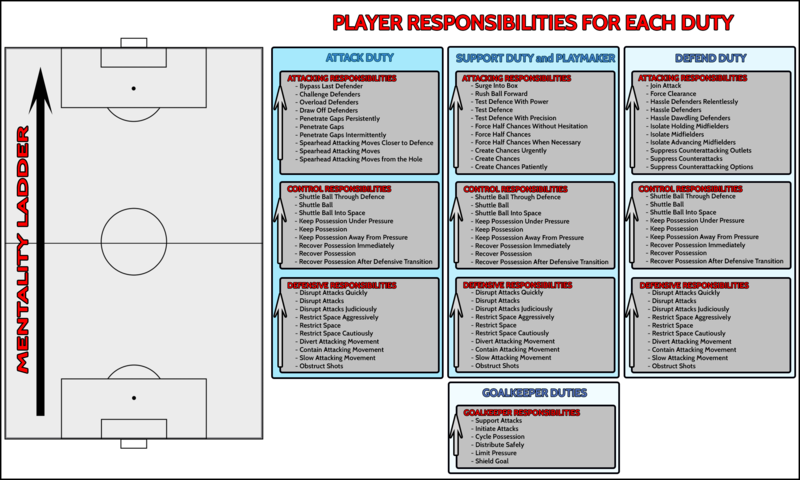 While defensive and control responsibilities are the same for all outfield players, duty determines the nature of a player's attacking responsibilities as support and defend duty players are less likely to take up responsibilities that necessarily involve getting into the opposition area. This is why there are three, duty-based versions of the mentality ladder for outfield players, though in effect, each operates according to the same principles. Finally, it should be noted that duty does not affect playmaker roles in the same manner they affect other roles. All playmakers will look to stay behind the forefront of the attack and look for space from which to play dangerous balls forward. To reflect this, all playmaker roles (i.e., the Deep Lying Playmaker, Advanced Playmaker, Enganche and Trequartista), regardless of assigned duty, are interpreted as following the "Support Duty" path. As I will explain in more detail below, a player's effective position on the mentality ladder is dynamic and responsive to how play is developing. While a player's tactical priority certainly influences and informs the mentality and decision-making with which he approaches the task at hand, no player is ever constrained to just one task and all players respond in some manner to the current phase of play. In other words, a player's tactical priority represents what task the player will primarily be focused on carrying out as well as the point at which a player will typically look to get directly involved in play, but all outfield players will move up and down the ladder in response to what's actually happening on the pitch. Generally, players will attempt to find a balance between successfully carrying out the current task and carrying out that task in a way that serves their tactical priority. Again, a tactical priority is not a constraint but a guiding point of reference to which a player gravitates while taking up and carrying out a multitude of responsibilities during the match. Of course, much depends on how well your players play. When your players decisively outplay your opponent, they will spend much or most of their time carrying out their tactical priority, but if they struggle, they will spend more time being forced to carry out tasks further down the mentality ladder. Thus, a very fluid overload tactic may direct nearly all of your team to get into or around the opposition penalty area, but ultimately, they still need to play well enough to carry out such an ambitious objective. In this sense, outplaying your opponent or nullifying their tactics can be thought of as the extent to which you force them to deviate from their tactical priorities. Accordingly, it's important to keep in mind that a player's position on the mentality ladder does not necessarily correspond to a player's current physical location on the pitch. Rather, it represents a player's mental orientation, and while each position on the ladder does direct a player towards playing the ball in a certain area of the pitch, there will be points in a match where a player is focused on moving either himself or the ball into another area of the pitch. This may mean the player is simply out of position or transitioning to a new phase of play, but it could also mean that the player is setting himself up to quickly perform a task in anticipation of the progression of play or has been asked to play a tactical function that involves playing the ball back to teammates advancing from deeper positions. If you're not averse to mixing metaphors, you can think of players as having a sort of imaginary elastic cord that attaches them (in a mental sense) to the rung representing their tactical priority. Thus, while all players will move up and down the ladder (i.e., take up different responsibilities in response to the present situation), the further they stretch the cord, the more the cord will pull back and noticeably influence their decision-making. A mentality structure is the way a team is organized by individual players' tactical priorities. It is shaped by a tactic's formation, fluidity, mentality, roles and duties, and it fundamentally determines how your team operates in attack and defence. In the following sections, I've listed the various fluidity/mentality combinations along with the tactical priorities for each position (and relevant roles and duties) under that combination. This will allow you to determine a given tactic's mentality structure and give you a better sense of how it will operate. A player's position also partially determines their tactical priority. Within the framework of the Tactics Creator, fluidity has mainly been thought of in terms of the team's overall strategic focus (or as it's now called, mentality), but here, the concept of a player's tactical priority makes a finer distinction on an individual level. Therefore, even in a very fluid system, a centreback and striker typically aren't going to share the exact same tactical priority. There is, rather, an inherent division of responsibilities established by the formation itself. This is plainly evident when watching a very fluid tactic in action. While a very fluid tactic will usually cause a team to collectively focus on a smaller number of tasks, the team doesn't all focus on the same task at once. Strikers will still tend to operate as the more advanced players while centrebacks will still be the ones holding the defensive line. With this in mind, a formation can be thought of as establishing a baseline mentality structure that fluidity modfies. In this baseline structure, players positioned further from their goal have a slightly more attacking orientation than those positioned directly behind them while wide players of a given positional stratum (e.g., defensive midfield, midfield, attacking midfield, etc.) have a slightly more attacking orientation than their central counterparts. In the following outlines of the various mentality structures, I've attempted to reflect this to provide a better sense of how the mentality structures actually operate in practice as well as emphasizing the effect of formation. In some mentality structures, especially balanced mentality structures, a player in an advanced position may have a less aggressive tactical priority than a player in a deeper position. As noted above, a tactical priority does not necessarily correspond to a physical position on the pitch, so this asymmetry between formation and tactical priority does not mean your formation (or to be precise, your defensive formation) will be altered. However, it does mean that the advanced player with the lower tactical priority will be more likely to drop deep to help players positioned much lower on the pitch (including providing positional cover for their forward runs), more cautious in his general decision-making with a greater tendency to hold off on a risky pass or tackle, and notably for playmakers, less urgent in advancing up the pitch and attempting runs deep into the attacking third. For players in deeper positions with more aggressive tactical priorities, the reverse is also true. Certainly, this may have a significant effect on how your team's shape develops at various points in the match, particularly during the attacking phase, but as discussed above, it's a question of movement and tendencies in decision-making. Again, a player's effective position on the mentality ladder is dynamic in response to the movement of the rest of the team, and in these sort of asymmetric arrangements of tactical priority, it typically means the advanced player with the less aggressive tactical priority will serve as a sort of cautionary check on the urgency of your team's play and look to control the tempo while staving off rash decisions when necessary. Good examples of this include the advanced playmaker who looks to dictate tempo from the hole until midfielders get forward to support the attack and the more aggressively positioned ball-winner who consistently looks to play the ball back to a creative player who initiates attacks from deep. Accordingly, these asymmetric arrangements should not be seen as somehow counterproductive or contradictory to your formation. On the contrary, such arrangements can be highly effective and useful in modeling certain tactical systems. For all fluidity settings, the team mentality setting defines the core tactical priority around which the mentality structure is based while the fluidity setting determines the degree of differentation between the tactical priorities of individual players. As you will notice when examining the mentality structures, no mentality structure on any fluidity setting will have a massive difference in tactical focus between any two players. This is necessary to prevent the team from becoming overly disconnected and, in effect, having players working against one another's tactical priorities. Ultimately, all mentality structures will sensibly base the team around a core set of tactical priorities in a way that ensures even the most defensive and attacking players are contributing to the team's basic objective in some way. Of course, this means that much of the in-game descriptions of fluidity and team mentality settings is simply inaccurate. No fluidity setting necessarily restricts any one type of player to any one phase of play nor does a high level of fluidity mean that, for example, an attacker told to go all-out attack will be more inclined to help defend than a striker in a rigid system told to do the same. In fact, team mentality is far more relevant than fluidity in terms of determining a defender's willingness to get forward or an attacker's willingness to track back, and it is simply not true that more fluid settings always increase their willingness to do so while more rigid settings decrease it. As discussed above, all players respond dynamically to the development of play, and this is true on all mentality and fluidity settings. Fluidity settings merely establish the basic orientation of individual players relative to the team mentality, and the interaction between fluidity and mentality is much more nuanced than the Tactics Creator descriptions seem to suggest. The following sections outline the anatomy of the various mentality structures. The outlines are grouped under fluidity settings and presented in order from most defensive to most attacking. The specific tactical priorities in each fluidity/mentality combination are listed by position with unique role or duty exceptions listed in italics under the position. Hopefully, these outlines will serve as a useful reference point as you set out to put your tactical vision into practice. However, keep in mind that these outlines only present the most basic underlying foundation of a tactic. Subsequent sections will delve into more detail regarding the interaction between tactical priority and duty in various phases of play. Simply, understanding this interaction is essential to understanding how and why a tactic operates in the way it does, so while these outlines are intended to provide a firm basis for tactical design, they merely represent the first step in that process. Very fluid mentality structures cover the smallest range of tactical priorities with the team as a whole sharply focused on carrying out a highly specific strategic objective (e.g., completely negating the opposition's attack, controlling possession in midfield, overloading the opposition third, etc.). This represents systems in which all players are expected to help contribute to a general, collective function and in which, accordingly, there is significantly less differentiation between players based on position and role. While this demands a greater degree of versatilty and tactical awareness from each of the players, it encourages the team to cooperate closely in carrying out specific tasks while promoting more movement between positional strata and, thus, greater variety and unpredictability in the team's play. Certain very fluid mentality structures are subject to the Controller Effect. Essentially, under a more defensive team mentality, using a designated playmaker with a lower tactical priority than other roles in the same position will cause others on the team to become slightly more aggressive. In practical terms, this represents a playmaker who stays deeper than other players in his position to focus on controlling the flow and tempo of the match. His non-controller teammates, accordingly, become slightly more aggressive to compensate for the controller-playmaker's more cautious orienation. The Controller Effect applies to very fluid contain, defensive and counter mentality structures that use a Trequartista at ST, an Advanced Playmaker at AMC/L/R, a Deep-Lying Playmaker at CM or a Sweeper (that is, the role, not the position). In the following outlines, you should move each outfield player (with the exception of other sweepers, DLPs at MC, APs at AMLRC and trequartistas at ST) up one position on the mentality ladder for Counter/Defensive mentalities and up two positions for Contain if the mentality structure is subject to the Controller Effect. Keep in mind, the Controller Effect does not affect other controller-playmakers regardless of their position, and the alterations imposed by the Controller Effect are the same regardless of how many controller-playmakers are used. Fluid mentality structures divide the team into two separate units each focused closely on a small but distinct range of tactical priorities. In effect, this creates a divided structure with a more aggressive, fluid attack backed by a significantly more cautious defence. The idea is that the entrenched, disciplined defensive unit frees the attacking unit to get forward without being distracted by pressing defensive responsibilities, though the division between the units calls for a higher degree of attacking/defensive specialization to ensure both can cope with the increased demands resulting from their relative isolation from one another. In practical terms, this represents a player who stays deeper than other players in his position to focus on controlling the flow and tempo of the match. His non-controller teammates, accordingly, become slightly more aggressive to compensate for the controller-playmaker's more cautious orienation. Balanced mentality structures divide the team into three units based on the duties assigned to individual players. As with fluid structures, a more cautious defensive unit provides a stable, structural core that frees a more adventurous attacking unit to get forward aggressively, though this is further balanced by a "supporting" unit that serves to provide a more consistent link between the two. However, since a player's respective unit is defined by his duty rather than position, this gives the manager greater flexibility in refining his defensive and attacking shape to fit the personnel at his disposal. Consequently, Balanced mentality structures can accommodate a high degree of either duty-based specialization or general versatility. Rigid mentality structures cover the broadest range of tactical priorities with roles sharply defining how players contribute to the team's strategic objective. While Balanced mentality structures can also cover a very wide range of tactical priorities, Rigid mentality structures organize tactical priorities according to position within the team's defensive shape regardless of duty (with a few exceptions). The idea is that each player has a more distinct and clearly defined function within the team compared to more fluid systems. The main purpose of this is to ensure a quick and well organized transition from defense to attack (and vice versa) with wide players moving up more readily to link the defence, support and attack. While this can make the team's approach somewhat predictable, it better enables players to play to their specific strengths while reducing the risk of the team getting bogged down in aimless, incoherent play. Previously, rigid mentality structures have been equated with archaic tactical systems in which specific positions are strictly limited to contributing to specific phases of play, but this is not an accurate depiction. Team mentality and duty are the primary factors in determining whether specific players get forward or drop back to defend. A rigid mentality structure merely causes players in different positions to be incrementally more cautious or adventurous to ensure a greater tactical distinction between positions and roles. This is quite different from limiting certain positions to a single phase of play. Very rigid mentality structures actually cover a narrower range of tactical priorities than rigid (and, potentially, balanced) mentality structures. Like rigid mentality structures, very rigid mentality structures organizes tactical priorities according to position within the team's defensive shape, but unlike rigid mentality structures, there is less of a general tactical distinction between wide and central players. This means that wide players are not specifically relied upon to help quickly link the various parts of the team, though the team as a whole will look to prevent either the attack or defence from becoming isolated by maintaining a slightly more compact shape. In practice, this means the team will be slightly slower to break from its defensive shape going forward, though centrebacks and forwards will also be slightly more inclined to help support the midfield compared to a rigid system. Basically, very rigid mentality structures are intended to produce highly organized football in which the team can execute a focused, precise attacking approach while maintaining the ability to quickly transition back to its defensive shape at a moment's notice. As with rigid mentality structures, this means players have a distinct and clearly defined function within the team with defensive position having an even greater influence on the decion-making of wide players. Accordingly, this can make the team's approach very predictable, though this isn't necessarily a problem for managers looking to perfect a highly specfic style of play. Very rigid mentality structures should also not be equated with limiting specific position's contribution to a single phase of play. Again, team mentality and duty are the primary factors in determining whether specific players get forward or drop back to defend. As attacking play progresses into the opposition half, players will climb up the mentality ladder. As previously noted, duty determines what sort of responsibilities a player takes up as attacking play moves into the final third, and it also determines how quickly they will do this relative to the rest of the team and the likelihood that they will take up responsibilities that necessarily involve making runs into and around the opposition area (i.e., attack duty attacking responsibilities). Defend, Stopper and Cover duty players are the most reluctant to climb the mentality ladder. As the team enters the attacking phase, these players will initially look to move to and hold their position in the mentality structure to focus on their tactical priority, but as attacking play progresses and more opposition players track back to help defend, they will climb the mentality ladder to cover space and assume responsibilities left behind by advancing support and attack duty players. When play advances deep into the opposition half, there is a chance that these players will briefly take up support or, on rare occasions, attack duty responsibilities when it is both safe and opportune to do so. This possibility is represented by the "Join Attack" task at the top of the Defend duty mentality ladder. "Join Attack," essentially, represents all the various support and attack duty attacking responsibilities. As such, it is not actually available as a tactical priority (as a player with such a priority would then cease to be a Defend duty player), and given Defend duty players' general hesitancy to move up the mentality ladder during the attacking phase, the responsibility is typically only taken up by players who have very aggressive tactical priorities. Support duty players will move up and down the ladder as necessary to prevent the attack from becoming too isolated. As the attacking phase begins, support duty players will attempt to quickly move into an area where they can receive the ball and focus on their tactical priority. From there, they will either look to circulate possession among nearby players or, depending on the risk involved and the player's tactical instructions, play the ball forward to an advancing teammate. As attack duty players and more advanced support duty players push the opposition defence deeper, a support duty player will readily move up behind them to prevent the attack from becoming isolated. When play advances deep into the opposition half, there is a chance that these players will briefly take up attack duty responsibilities when it is both safe and opportune to do so. This possibility is represented by the "Surge Into Box" task at the top of the Support duty and playmaker mentality ladder. As with "Join Attack," "Surge Into Box" represents all the various attack duty attacking responsibilities, and as noted above, this means it is not actually available as a tactical priority. However, given support duty players' greater tendency to move up the ladder compared to defend duty players, most such players with attacking or control-oriented tactical priorities will typically attempt forward runs periodically throughout the match, though as with defend duty players, it is contingent on the availability of defensive cover and teammates willing to take up their current attacking responsibilities. Whereas other players will tend to focus more heavily on their specified tactical priority in the attacking phase and be more hesitant to move forward once their main responsibilities have been securely carried out, attack duty players will rapidly climb the mentality ladder as soon as supporting teammates are available to help take up the attack duty player's main responsibility. In this sense, attack duty players view themselves as the vanguard of the team's progression, and while they may stay deep to help carry out a defensive or control-oriented responsibility, they will only look to initiate the task in question before pushing forward to create room for teammates to advance. Thus, just as support duty players with attack-oriented tactical priorities have a greater tendency to get forward themselves, attack duty players with control or defend-oriented tactical priorities will have a greater tendency to wait to receive the ball ahead of the defensive line and look for support before taking on the defence. However, unlike defend and support duty players, attack duty players will readily advance deep into the attacking third with minimal regard for the amount of defensive cover available. In this sense, when it comes to attack duty players, it is the manager's responsibility to ensure the structure is in place to ensure they get forward without compromising the team's ability to defend against counterattacks. The specific assignment of duties in a mentality structure will greatly affect how the team's shape develops in attack. In most situations, it's wise to keep a balanced arrangement of duties to ensure no one part of the team finds itself isolated and overwhelmed, and if circumstances demand a reorientation of the team's tactical priorities, altering the team mentality setting (and thus, mentality structure) is the most balanced and prudent option. Though different arrangements of team mentality, roles, formation and playing style may call for different arrangements to achieve an effective balance, all mentality structures should have at least two support duties, two attack duties and three defend/cover/stopper duties among the outfield players. Moreover, these duties should be spread out among the strikers, midfielders and defenders to ensure some degree of movement and stability between the lines. Of course, assigning two attack, two support and three defend leaves three outfield players without a duty. Traditionally, the general recommendation has been that these spare duties should be assigned in accordance with the team's mentality setting with more defensive team mentalities having more defend duties, more control-oriented team mentalities having more support duties and more attack-oriented team mentalities having more attack duties. However, there may be circumstances where simply assigning more of one type of duty may prove a better option for refocusing the team's attacking shape to serve a highly specific objective. This should only be done with careful consideration of what you're trying to achieve, and unbalanced mentality structures should never be indiscriminately taken into every match with no regard for the opposition. Unbalanced structures inherently lack versatility (this is what makes them unbalanced), and they all contain glaring weaknesses that will be readily exploited by most opponents. In terms of the mentality ladder, assigning more defend duties will lead to significantly less deviation from the mentality structure as much of the team's defensive shape will remain intact during the attacking phase. Predictably, this will reduce the risk of counter attacks, but it will also severely blunt the team's attacking momentum and make it difficult for the team to advance the ball up the pitch. Assigning more support duties will cause more of the team to gradually climb the mentality ladder as attacking play progress. This will give the team more avenues through which to advance the ball ahead of the attacking third, but this will cause either the defence to be more exposed or the attack to be more isolated. If a support duty is assigned in place of a defend duty, the team will be more vulnerable to counter attacks, and if a support duty is assigned in place of attack duty, the team will be presented with less opportunities to successfully play the ball into and around the opposition area, even if there are now more players looking for such opportunities. Assigning more attack duties will cause the team's shape to deviate dramatically from the mentality structure during the attacking phase (and keep in mind, this doesn't just apply to the player with the attack duty as any drastic movement on the mentality ladder from any one player will have a domino effect on the rest of the team). This will create more options for successfully playing the ball deep into the attacking third, but it will greatly increase the risk of counter attacks and leave less players looking for the best option to play the ball forward as the creative burden of linking the attack is shifted onto a smaller group of players. Finally, as previously noted, playmaker roles (i.e., the Advanced Playmaker, Deep Lying Playmaker, Enganche, Regista and Trequartista) are considered support duty players for the purposes of the mentality ladder since they all have the tendency to stay deep and support play rather than actually getting forward. WIth this in mind, you should consider assigning an additional attack duty when using a playmaker role with a nominal attack duty, as this will prevent being presented with a dearth of options going forward. Moreover, the specialized nature of the playmaker himself means too many additional support roles may end up being redundant. An implicit, yet important, concept in all this is the distinction between formation and attacking shape. A mentality structure can be thought of as a combination of the two, and while the football punditry often glosses over this distinction in tactical discussions, it is crucial to understanding how and why your team attacks and defends as it does. Unless you follow the inadvisable route of simply assigning defend duties to defenders, support duties to midfielders and attack duties to strikers, your team will not attack in the shape of your assigned formation. A common misconception is that a rigid or very rigid fluidity will cause this to happen, but that is not the case. While these fluidity settings will cause your attack to be more regimented by affecting the fine margins of how attack and support duty players prioritize tasks, they will not prevent attack duty players from attempting to get forward or support duty players from following up behind the attack. Visualizing exactly how your formation transforms into its attacking shape is one of the more challenging aspects of designing a tactic, and in fact, there is no simple way to do this. Much will depend on how your attack shapes around the structure and quality of the opposition's defence, but duty can give you an imperfect sense of how to translate your attacking shape into the nomenclature of formation. In general, attack duties will add more numbers to the striker and attacking midfield strata, support duties will add more numbers to the central midfield stratum and defend duties will add more numbers to the defensive midfield and defender strata. Again, this is a highly imperfect method, but if you're having trouble sorting out how a mentality structure will operate, it may prove helpful. It is also important to remember that you do not need to set your formation to your desired attacking shape. For example, playing a 4-2-3-1 does not require playing three attacking midfielders behind the striker. The attacking shape usually associated with the 4-2-3-1 formation can be accomplished with numerous formations given the appropriate assignment of duties, roles and personal instructions. Many real world 4-2-3-1s are better interpreted as 4411s, 451s or even 442s in Football Manager. When attacking play breaks down and your players are forced to play the ball back to keep possession, all players will begin to move back down the ladder with defend and support duty players being more inclined to quickly gravitate back towards their tactical priority. Usually, only players with the most attack-oriented tactical priorities will simply drift around looking for space in the box while possession is being recycled, and of course, even they will drop deeper if play is pulled back deep enough to allow the opposition's defensive line to push up. In general, when off the ball with a teammate in possession well inside the opposition's half, attack duty players with tactical priorities that call for them to be beyond the current position of the opposition's defensive line will either sit on the shoulder of the last defender or drift into available space ahead of the defence. For centrebacks, your defensive line instructions will also have an effect. For the most part, centrebacks will be highly reluctant to deviate from a position that enables them to maintain a focus on their tactical priority. Therefore, your most cautious centreback's tactical priority will give you a good sense of where your default defensive line will be positioned while your defensive line instruction will control how far they deviate from this position. A lower defensive line will strictly limit how high your centrebacks will climb up the ladder whereas a higher defensive line will allow them to climb higher than normal, though even on the most aggressive settings, centrebacks generally won't position themselves to do much more than suppress counterattacks. Accordingly, the defensive line instruction has less significance for centrebacks with more aggressive tactical priorities as there is less "space" between the upper limit to which they may push up and the tactical priority towards which they are inclined to drop. In the defensive phase, much of the above applies in defensive terms. For the most part, centrebacks will gravitate with the rest of the team towards their tactical priority in reconstituting their defensive posture, though your defensive line instructions will determine how likely they are to push up from their default position to collectively press with a high block intended to compress the space in which the opposition can play the ball. When your opponent regains possession, your team will transition to the defensive phase by reorganizing into its basic defensive shape. In other words, players will descend back down the mentality ladder to their tactical priority with more defensively oriented players typically doing so with more urgency. However, it's important to keep in mind that your mentality structure mainly determines how and where your players will first attempt to win the ball, but as the opposition's attacking play progresses into your half, your team will respond by climbing down the mentality ladder accordingly. For players with a more attacking mentality, their tactical priority will determine how soon they'll stop waiting to break forward and start tracking back to defend with the rest of the team. For the most part, the fundamental organization of your mentality structure will hold as this defensive descent down the ladder occurs, so even if your tactic is operating on a more aggressive mentality setting, the structures for the lower mentality settings will provide an indication of how your fluidity setting will affect your defensive shape as it drops deeper. It's important to note that this means players with aggressive tactical priorities won't be in any hurry to track back into the defensive third. With certain style and mentality combinations, this means your strikers and attacking midfielders will generally stay forward with the intention of initiating counterattacks from recovered clearances or intercepted back passes. Additionally, strikers and attacking midfielders aren't going to be inclined to help central and defensive midfielders cover space behind the ball, so using an abundance of attacking players will naturally increase the likelihood that your defensive shape will contain glaring gaps for the opposition to exploit. While the pace and directness with which attacking play develops is determined by several different settings and instructions, a player's tactical priority largely determines the amount of risk they're willing to take to either create a chance or just simply move the ball into a more advanced position. For the most part, a player with a more aggressive tactical priority will take more risks to impose offensive pressure on the opposition and play through defensive pressure imposed by the opposition in order to ensure play advances to an area of the pitch where he will be able to carry out his priority's associated task. This tendency remains consistent regardless of where a player happens to actually be on the mentality ladder. In other words, even as players move up and down the mentality ladder to carry out different tasks, they will still persistently gravitate towards their tactical priority via higher or lower risk decision-making. Thus, for example, players with attack-oriented tactical priorities will look to play the ball out from a precarious defensive position rather than simply hoofing it clear while players with defend or control-oriented tactical priorities will be more inclined to pass the ball around in the opposition half rather than attempt to force a half-chance. Again, though numerous team and personal instructions can affect the details of a player's decision-making, a player's tactical priority will give you a very general indication of how they'll behave at various points along the mentality ladder. Defensive-oriented players will mainly focus on keeping the ball well clear of the defensive third and minimizing the risk of being hit on the break. Control-oriented players will mainly focus on keeping the ball circulating through a certain area of the pitch until they see a clear opportunity to play it forward (assuming, of course, this opportunity conforms with their tactical instructions or, failing that, personal tendencies as a player). Attack-oriented players will show significantly less regard for maintaining possession as they focus on simply moving the ball up the pitch and into the attacking third (again, in accordance with their other tactical instructions and personal playing tendencies) . This relationship is largely what makes a particular task or responsibility that player's priority. While I have so far emphasized that mentality structures are dynamic with players shifting up and down the ladder to take up different tasks when appropriate, this does not mean a player simply loses sight of what he's primarily supposed to do when circumstance demands that he does something else. Players with different tactical priorities will play differently even if they happen to be on the same rung of the mentality ladder. The influence of tactical priority applies to duty as well. Though attack duty players will all attempt to push play into the opposition area, their tactical priority will influence how they go about doing this. Thus, for example, an attack duty player with a lower tactical priority will be more risk-averse than another attack-duty player with a higher tactical priority, even if they are both currently attempting to, for example, penetrate gaps or overload a defender. Again, in the most practical terms, a player's tactical priority reflects the degree of risk they're willing to take to perform any given action on the pitch. This includes getting forward, passing, dribbling, shooting, tackling, basic positioning and basically every conscious act that a footballer might perform. The attacking priorities in the upper third of the ladder will, thus, lead a player to take more risks to move the ball up the pitch, create chances and promptly regain possession. The control priorities in the middle third of the ladder will lead a player to try to balance risks in various aspects of play. In general, this will lead him to emphasize maintaining possession, as he will neither be too wasteful with his passing in the opposition half nor too hasty to clear the ball from danger in his own. The defensive priorities in the lower third of the ladder will lead a player to limit risk with a greater emphasis on simply preventing opposition chances and holding onto the ball when not under pressure. Role mainly functions by increasing a player's preference for performing certain actions over others, so in terms of tactical priority, it can be thought of as modifying the acceptable level of risk that a player is willing to take to perform a specific action (e.g., dribbling, passing, tackling, shooting from distance, etc.). Of course, no setting will make a player a mere robot. Players will deviate from their role's instruction if the action in question appears to have the highest potential benefit and the risk is low enough. However, as risk naturally escalates with a phase of play culminating in an attacking move, the collective effects of tactical priority and role will become more pronounced. The basic level of risk-taking established by a player's tactical priority is further modified by a player's expressiveness. A player's level of expressiveness is controlled both by their flair attribute and tactical instructions. A higher degree of expressiveness will raise the maximum risk a player is willing to accept to perform specific types of actions when in possession. In effect, it will primarily make the player more likely to attempt ambitious, higher risk actions to achieve greater benefits in attacking play. Notably, by counteracting the more restrictive tactical instructions imposed by roles, it will also cause a player to be more likely to deviate from their role when they perceive it as beneficial. A team's fluidity setting has a significant influence on the expressiveness of players. More fluid settings will encourage players to be more expressive while more rigid settings will encourage players to be less expressive. Thus, in more fluid settings, players will generally be more ambitious in how they choose to carry out their tactical priority and will deviate more readily from the confines of their role (especially if the role imposes numerous restrictions on how the player plays), whereas players in more rigid settings will be more disciplined and methodical in how they choose to carry out their tactical priority with less deviation from any restrictions imposed by their role. Aggression can be thought of as the defensive counterpart of flair. While flair modifies a player's tendency to attempt more ambitious actions in possession, aggression will increase a player's tendency to take risks when out of possession. Specifically, a highly aggressive player will look to get directly involved in defensive play at every opportunity with a greater willingness to get stuck in and risk fouls. On the other hand, a more passive player will tend to sit back and help the team maintain its shape while waiting for clear cut opportunities to dispossess opposition attackers. As tendency attributes, neither flair nor aggression are necessarily good or bad, though you should carefully consider how they might affect the system you are attempting to put in place. Players with high ratings in these attributes are often a poor fit for roles that demand a high level of tactical discipline while players with low ratings may prove too cautious for roles that call for a player to take charge and improvise when necessary. The roaming instruction controls what is often referred to as positional fluidity, so not surprisingly, roaming and fluidity are often confused with one another. However, though the distinction between the two may appear subtle on the first glance, they are quite different. As noted in the introduction, team fluidity represents more of a general principle of tactical organization that controls how many players will focus on a given task at one time and how closely players in different positional strata will work together to carry out their individual responsibilities. However, while fluidity is largely a managerial concept that serves as an abstract and somewhat esoteric representation of a set of more mundane instructions, roaming is a much more simple footballing concept that applies to an individual player. In short, the roaming instruction gives a player more freedom to break from the team's basic shape to open up play or provide positional support for a teammate. To a great extent, this will cause a player's lateral movement to be much more dynamic, though in terms of the mentality ladder, roaming can be thought of as also making a player's movement up and down the ladder much more eratic and unpredictable in relation to the rest of the team and, by extension, the mentality structure. Thus, a roaming player will be much more likely to take up responsibilities well outside the basic organizational framework specified by the team's mentality, fluidity and duty settings. Notably, the team fluidity setting does not affect how many players are permitted to roam. The amount of roaming permitted is primarily determined by the mentality setting, though certain roles will always be permitted to roam by default. Thus, both very rigid and very fluid systems can accomodate high levels of positional "fluidity." As you may have noticed in the prior sections, more fluid settings do not necessarily equate to a greater gap between the tactical priority of forwards and the tactical priority of the deepest defender, only the number and degree of the distinctions in tactical priority between various roles and positions. While fluidity will affect how "vertically" expansive or compact your team's shape will be at various points in attacking and defensive play, both sides of the continuum give you options. In fact, the fluid and rigid settings are actually mirror images of one another with "Very Rigid" and "Very Fluid" resulting in a generally more compact shape while "Rigid" and "Fluid" result in a generally more expansive shape ("Balanced," on the other hand, offers more flexibility). But again, fluidity merely modifies other tactical settings at the most abstract level. In terms of defining the team's shape for the various phases of play, fluidity is only one component along with formation, duty assignment, role, etc. Ultimately, no matter how compact or expansive the shape, all teams attack and defend as a whole to the extent that the entire team will collectively climb up and down the mentality ladder in accordance with a specific organizational framework (or rather, mentality structure). In other words, no player ever wholly disconnects from the broader activity of the team, and even the striker who discourages overlapping runs by roaming into gaps in the defensive line or the defender who cautiously recycles possession from deep within his own half can be said to contribute to defence or attack to some degree. Fluidity, in this sense, is not a question of whether a team coheres as a single, cooperative unit during a given phase of play. Fluidity simply determines how many different tasks the team will usually be focused on carrying out at any given moment, or in terms of the mentality ladder, it determines how many positions or rungs the players occupy at any given moment. A more fluid system will usually have the team focused on less tasks as a whole with more players focused on carrying out a specific task. A more rigid system will have the team as a whole focused on more tasks with less players focused on carrying out a specific task. In both cases, the team will be structured around a group of core tasks of a certain type (i.e., defensive, controlling, attacking as defined by the team's mentality setting), but more rigid teams will typically have a greater degree of stratification between different positions and roles. Accordingly, fluid systems are associated with generalism (also referred to as universalism), the idea that players should be more versatile and intuitive in their play while cooperating closely to carry out specific tasks. The greater number of players focused on or closely supporting specific tasks means the team has more options available for successfully carrying out each task. However, it also means the team may progress up the ladder in a slower, more disorganized fashion while the players themselves are more likely to be called upon to carry out a broader range of tactical responsibilities during a single phase of play. This is why it's recommended that managers who prefer a more fluid system make more use of the more generic roles that are designed to carry out multiple tasks. In contrast, rigid systems are associated with specialism, the idea that players should focus on a more refined set of skills and tactical instructions to optimize their ability to carry out specific tasks. The smaller number of players focused on or closely supporting specific tasks means the team can typically progress up the ladder in a faster, more efficient manner with players less likely to deviate too far from their tactical comfort zone, but reversing the benefits and drawbacks of a fluid system, it also means the team has fewer immediately options available for successfully carrying out each task and can become disjointed if one link in the chain is effectively targeted by the opposition or just simply underperforms. And this is why it's recommended that managers who prefer a more rigid system make more use of the specialist roles that are designed to optimize their ability to individually carry out specific tasks. Expressiveness, as discussed above, is also an important aspect of this distinction. More fluidity promotes more expressiveness which, in turn, encourages players to take the initiative with higher risk actions and deviate more from restrictions imposed by their roles. On the other hand, more rigidity promotes less expressiveness which encourages players to adhere to the restrictions imposed by their roles and stick with the plan set forth by the manager. In this sense, rigid structures promote a system-oriented approach to the game. Players adhere to a more restrictive style of play with the assumption being that the aggregate effect of adhering to a more coherent plan will ultimately prove more beneficial than the aggregate effect of simply letting players follow their intuitions on a moment-by-moment basis. In other words, the rigid, system-oriented approach asserts that the whole is greater than its parts with the best possible sequence of play not always resulting from the "best" option in an individual moment of play. In contrast, fluid structures promote a more player-oriented, intuitive approach to the game. Players adhere less to the restrictions imposed by the system with the assumption being that the aggregate effect of players intuitively responding to dynamic situations will ultimately prove more beneficial than the aggregate effect of expecting a strictly defined system to adequately adapt to every possible context. In other words, the fluid, player-oriented approach asserts that the collective depends on the ingenuity of the individual to effectively adapt to the chaos of a football match with the best possible sequence of play rarely resulting from attempting to impose order on what is essentially an exercise in disorder. A counter attack phase is initiated when your team gains possession and the opposition has left itself exposed or overextended with a lack of defenders between the ball and goal. The counter attack phase effectively overrides your mentality structure by causing all players to assume the highest position on their respective mentality ladders and temporarily focus on overloading the opposition defence. All players will immediately begin climbing the mentality ladder with an extreme level of urgency, and only defend duty players will hold off from attacking the opposition's third (though even they will be to do so if there are sufficient number of teammates behind them). This temporary alteration of the mentality structure will continue until the opposition regains possession or gets an adequate number of players back between the ball and goal. All teams, regardless of style and mentality, will enter the counter attack phase when the aforementioned conditions are met. The frequency of counter attacks will mainly be determined by the way your tactical settings interact with those of the opposition, though some team mentality settings encourage players to enter the phase more readily. On the Defensive, Counter and Overload mentalities, teams will be more inclined to enter the counter attack phase when there are a slightly greater number of defenders between the ball and the goal. In the case of Defensive and Counter mentalities, this better enables these more defensive mentalities to alternate between more cautious build-up plays and fast breaks without needlessly giving away possession. Moreover, since more defensive mentalities allow the opposition to come deeper, counter attacks will usually have more depth to work with going forward. Thus, even if the opposition has slightly greater numbers behind the ball, there is a good chance their defenders will be scrambling to cover a large expanse of space ahead of their goal. In the case of Overload mentalities, this merely ensures that your players break forward at every opening. On a Contain mentality, the team will be more inclined to keep possession and hold up the ball in advanced positions when possible, so counter attacks are less likely to occur. On a Standard, Control and Attack mentality, counter attacks are less likely to occur after winning the ball in a deep position. Since these mentalities already encourage relatively quick build-up play, the players will be more inclined to carry out a more elaborate build-up at a faster pace, though the counter attack phase will still be initiated if the opposition has left its defence badly exposed. Additionally, since you will typically go up against more cautious opponents when using these mentalities, it ensures your side won't simply bomb forward directly into an entrenched, well organized defence when a more considered approach is necessary. On these more aggressive mentalities, the counter attack phase will be more likely occur when an attacker manages to win the ball in an advanced position or if you happen to be playing an open game against another aggressive opponent. As such, if you want to facilitate more quick breaks on these settings, you will need to ensure you have attackers pressing the opposition's deep-lying midfielders and defenders. Closing down settings function by modifying a player's willingness to break from the defensive shape to press an opponent on the ball. For the most part, it determines how quickly and how far a player is willing to venture forward to close down the opposition, but as with other settings, this is relative to the risk and reward involved. A player's tactical priority will give you a good sense of the default point in the defensive phase at which a player will start pressing the opposition as well as the manner in which they go about closing down the opponent (e.g., promptly diving into a tackle or methodically restricting space from a comfortable distance... or any degree in between). Accordingly, there is no fixed location on the pitch which will always prompt a player to immediately close down the opposition. There are always limits to how far a player will venture from their defensive position, even if they have an aggressive tactical priority and are assigned to press higher. Generally, a player won't venture too far beyond the zone defined by the team's defensive shape unless there is both sufficient positional cover behind him and a sizable, undefended gap between himself and the player with the ball. Various instructions and settings will also have an effect on how quickly players move up the mentality ladder. More direct and riskier passing will cause the ball to move up the pitch more quickly, often causing the midfield to be bypassed altogether. This, consequently, will cause players to move up the mentality ladder more quickly. In previous versions, passing risk was controlled by the "through balls" instruction, but this name often created the misconception that it only referred to attempts to play the ball behind the defensive line. Now, this instruction is referred to as the more appropriately general "risky passing." Telling a player to attempt riskier passing increases their tendency to attempt passes behind or between defenders with the intent of getting the intended recipient beyond his marker. Thus, less risky passing will encourage players on the ball to wait for options to drop back and make themselves available for a pass while more risky passing will encourage players to play the ball through gaps in the defence (though not necessarily beyond the defence as a whole). Some team instructions will have a direct effect on your mentality structure. "Exploit the Flanks" will increase the tactical priority of your fullbacks or wingbacks while effectively giving them all an attack duty. While the alteration of tactical priority is variable depending on your team mentality, the idea is that it will essentially encourage your fullbacks or wingbacks to operate more like wide midfielders. "Exploit the Middle" will give a more aggressive duty to all central players other than keepers, sweepers and centrebacks while giving a more cautious duty to all wide players. Thus, defend duty central players take up a support duty, support duty central players take up an attack duty, attack duty wide players take up a support duty, and support duty wide players take up a defend duty. "Look for Overlap" works much like "Exploit the Flanks" with the added effect of wingers and wide forwards being given a more cautious duty to cover for the more aggressive fullbacks and wingbacks. "Take a Breather" effectively instructs everyone to drop down to a more cautious duty (i.e., attack duty players become support duty players while support duty players become defend duty players). In practical terms, this encourages your team to just sit back and avoid moving play into the attacking third. In this final section, you will find a brief description of the various tactical priorities for both outfield players and goalkeepers. Each tactical priority serves as a general point of reference that clarifies how a player is supposed to function within a broader tactical system. However, again, it is important to distinguish between tactical priority and role. While a tactical priority tells a player what he's supposed to focus on doing within a given system, the exact details regarding how a player goes about doing it is further refined by role and duty. Accordingly, effectively putting the mentality ladder into practice requires considering a player's tactical priority in relation to his role. For example, while a trequartista can be given a "defensive" tactical priority, the particular instructions of the role will typically cause him to emphasize more passive aspects of defending like hunting down clearances, denying passing angles, discouraging forward runs from defenders, etc. Similarly, a ball-winning midfielder told to sit deep and help contain incoming attacks will be much more defensively aggressive relative to teammates with the same priority and more inclined to break from the defensive shape to do what he's been told to do. The relationship between duty and tactical priority is less nuanced and more easily outlined in broad terms. Simply, as discussed in the prior section, it controls the willingness and urgency with which a player progresses beyond his tactical priority during attacking play. To this extent, the following duty descriptions can be appended to any tactical priority description. Note, again, that the playmaker roles (i.e., the Regista, Deep Lying Playmaker, Advanced Playmaker, Enganche and Trequartista) should all, in practice, use the Support Duty description. With an attack duty, the player will look to immediately advance into an attacking position after helping to carry out his tactical priority. With a support duty, the player will aim to securely carry out his tactical priority and wait for sufficient defensive cover before advancing forward to provide close support to players in attacking positions. With a defend/cover/stopper duty, the player will mainly stick to his defensive position during the attacking phase and only advance forward when there is minimal risk involved. Under the current team mentality and fluidity instructions, this player will be inclined to position himself very deep with an aim towards simply blocking passing and shooting angles in and around his penalty area. Under the current team mentality and fluidity instructions, this player will focus on containing runs into the defensive third with a greater emphasis on simply impeding the momentum of the attack until there is enough defensive support to safely deal with the threat. Under the current team mentality and fluidity instructions, this player will focus on containing runs into the defensive third by impeding the momentum of the attack and, if enough defensive support is available, diverting attackers into areas where they will pose less of a threat. Under the current team mentality and fluidity instructions, this player will focus on containing runs into the defensive third with a greater willingness to hold his ground ahead of the penalty area to force attackers into areas where they will pose less of a threat. Under the current team mentality and fluidity instructions, this player will focus on denying opposition attackers space in which to play the ball with a greater emphasis on attempting to simply force technical errors without giving away a foul. Under the current team mentality and fluidity instructions, this player will focus on denying opposition attackers space in which to receive and play the ball while being careful not to give away a foul in a dangerous area. Under the current team mentality and fluidity instructions, this player will focus on denying opposition attackers space in which to receive and play the ball with a slightly greater willingness to challenge for the ball when the opportunity presents itself. Under the current team mentality and fluidity instructions, this player will focus on challenging opposition attackers as they venture deep into the defensive half and promptly clearing the ball from dangerous areas. Under the current team mentality and fluidity instructions, this player will focus on challenging opposition attackers as they venture into the defensive half and, if no safe passing options are available, promptly clearing the ball from dangerous areas. Under the current team mentality and fluidity instructions, this player will focus on promptly challenging advancing opposition attackers and carefully getting the ball forward without needlessly compromising the team's defensive shape. Under the current team mentality and fluidity instructions, this player will focus on venturing forward and challenging for possession in the centre of the park once the team has securely transitioned into a cohesive defensive shape. Under the current team mentality and fluidity instructions, this player will focus on venturing forward and regaining possession in the centre of the park when sufficient defensive cover is available. Under the current team mentality and fluidity instructions, this player will focus on venturing forward and regaining possession in the centre of the park before the opposition can coordinate its attack. Under the current team mentality and fluidity instructions, this player will focus on winning and holding onto the ball in the centre of the park with a greater inclination to securely play it back deep into his own half in order to draw out the opposition defence. Under the current team mentality and fluidity instructions, this player will focus on winning and holding onto the ball in the centre of the park until it can be securely moved into a more advanced area. Under the current team mentality and fluidity instructions, this player will focus on winning and holding onto the ball in the centre of the park with a greater emphasis on luring nearby defenders out of position in order to create space for advancing teammates. Under the current team mentality and fluidity instructions, the player will focus on taking possession of the ball near or inside the opposition half and promptly moving it into the attacking third while being careful not to needlessly play it into the path of a defender. Under the current team mentality and fluidity instructions, the player will focus on taking possession of the ball near or inside the opposition half and promptly moving it into the attacking third. Under the current team mentality and fluidity instructions, the player will focus on taking possession of the ball inside the opposition half and promptly moving it into the attacking third with a greater willingness to take on or thread the ball between defenders. Under the current team mentality and fluidity instructions, the player will focus on sitting behind the attack in the opposition half before moving to aggressively deny space to opposition forwards looking to break forward on the counter. Under the current team mentality and fluidity instructions, the player will focus on sitting behind the attack in the opposition half before moving to aggressively mark or close down opposition forwards and attacking midfielders looking to initiate a quick counterattack. Under the current team mentality and fluidity instructions, the player will focus on sitting behind the attack in the opposition half before aggressively moving to close down opposition players attempting to receive passes or recover clearances in the hole between the midfield and defence. Under the current team mentality and fluidity instructions, the player will focus on sitting behind the attack in the opposition half before quickly moving to disrupt the opposition's build-up play by aggressively marking and closing down opposition midfielders attempting to get forward to support a counterattack. Under the current team mentality and fluidity instructions, the player will focus on sitting behind the attack in the opposition half before quickly moving to disrupt the opposition's build-up play by aggressively marking and closing down opposition midfielders attempting to advance play out of their own third. Under the current team mentality and fluidity instructions, the player will focus on sitting behind the attack in the opposition half before quickly moving to disrupt the opposition's build-up play by aggressively closing opposition midfielders attempting to hold onto or play the ball from within their own third. Under the current team mentality and fluidity instructions, the player will focus on sitting behind the attack in the opposition half before quickly moving to disrupt the opposition's build-up play and initiate counterattacking opportunities by closing down defenders who either appear hesitant to move the ball forward or are purposefully attempting to waste time by passing it around in the defensive third. Under the current team mentality and fluidity instructions, the player will focus on sitting behind the attack in the opposition half before quickly moving to disrupt the opposition's build-up play and initiate counterattacking opportunities by aggressively closing down defenders attempting to play the ball out from the back. Under the current team mentality and fluidity instructions, the player will focus on sitting behind the attack in the opposition half before quickly moving to disrupt the opposition's build-up play and initiate immediate counterattacking opportunities by aggressively closing down defenders attempting to get the ball out of their own third. Under the current team mentality and fluidity instructions, the player will focus on sitting behind the attack in the opposition half before quickly moving to force either the defender or the goalkeeper into a hasty clearance. This task is not available as a tactical priority in any mentality structure. If teammates take up the player's responsibilities and provide sufficient defensive cover, a defend duty player will momentarily assume support duty attacking responsibilities or, on rare occasions, attack duty attacking responsibilities if a good opportunity presents itself. Under the current team mentality and fluidity instructions, the player will focus on finding space ahead of the defence from which he can receive the ball and, if possible, wait for a clear opportunity to craft a chance before he is closed down by opposition defenders. Under the current team mentality and fluidity instructions, the player will focus on finding space ahead of the defence from which he can receive the ball and look for an opportunity to craft a chance before he is he closed down by opposition defenders. Under the current team mentality and fluidity instructions, the player will focus on finding space ahead of the defence from which he can receive the ball and look to quickly craft a chance as soon as a credible opportunity emerges. Under the current team mentality and fluidity instructions, the player will focus on getting onto the ball in advanced areas and crafting chances with a greater willingness to attempt to force a chance when support is lacking and no clear opportunities appear likely to emerge. Under the current team mentality and fluidity instructions, the player will focus on getting onto the ball in advanced areas and crafting chances, though rather than patiently probe a stubborn defence, he will be more inclined to attempt to force a chance to sustain the momentum of the attack. Under the current team mentality and fluidity instructions, the player will focus on getting onto the ball in advanced areas and attempting to craft a chance at the first possible opportunity. Under the current team mentality and fluidity instructions, the player will focus on finding occasional opportunities to test the opposition defence's concentration and discipline with carefully placed shots and precise passes intended to cause panic and indecision. Under the current team mentality and fluidity instructions, the player will focus on testing the opposition defence's concentration and discipline by periodically taking a shot on goal or playing a hopeful ball into the area with the intent of provoking panic and indecision. Under the current team mentality and fluidity instructions, the player will focus on testing the opposition defence's concentration and discipline with a much greater willingness to simply blast the ball goalwards or lob it into the area when other options appear limited. Under the current team mentality and fluidity instructions, the player will focus on simply overwhelming the opposition defence by playing hopeful balls into the area at every opportunity. This task is not available as a tactical priority in any mentality structure. If teammates take up the player's responsibilities and provide sufficient defensive cover, a support duty player will momentarily assume attack duty attacking responsibilities if a good opportunity presents itself. Under the current team mentality and fluidity instructions, the player will focus on utilizing space between the opposition midfield and defence to make himself available for passes before either running at the defence or attempting to quickly link up with another advancing attacker. Under the current team mentality and fluidity instructions, the player will focus on finding space near the opposition defence to make himself available for passes before either running at the defence or attempting to quickly link up with another advancing attacker. Under the current team mentality and fluidity instructions, the player will focus on persistently pushing up against and dropping back from the opposition defensive line to both lure defenders out of position and make himself available for passes before either running at the defence or attempting to quickly link up with another advancing attacker. Under the current team mentality and fluidity instructions, the player will focus on staying forward and, when not needed to help link up the attack, looking for openings to run deep into the attacking third. Under the current team mentality and fluidity instructions, the player will focus on staying forward and, when sufficient support is available, moving deep into the attacking third to either stretch the defence or get on the end of chances. Under the current team mentality and fluidity instructions, the player will focus on staying forward and immediately exploiting any defensive gaps that open up in the attacking third. Under the current team mentality and fluidity instructions, the player will focus on staying forward and pushing up against the opposition defensive line while looking to either immediately break forward on the counter or drag defenders out of position to create space for teammates' runs and passes. Under the current team meantlity and fluidity instructions, the player will focus on staying forward and pushing up against the opposition defensive line while looking to either break forward on the counter, drag defenders out of position or simply provide a physical presence to occupy and obstruct them as teammates look overload the opposition penalty area. Under the current team mentality and fluidity instructions, the player will focus on staying forward and pushing up against the opposition defensive line while looking to either break forward on the counter or provoke panic among opposition defenders by providing a persistent, aggressive presence poised to get on the end of any balls played into the opposition penalty area. Under the current team mentality and fluidity instructions, the player will focus on simply sitting on the shoulder of the last defender at all times with the intention of pinning back the opposition defence and breaking forward into space at every opportunity. Under the current team mentality and fluidity instructions, the goalkeeper will mainly rely on his defenders to obstruct shooting angles as he focuses on stopping shots from the line and claiming balls played across the six yard box. Under the current team mentality and fluidity instructions, the goalkeeper will focus on minimizing the risk of being exposed by defensive errors with a strong tendency to dwell on claimed balls and kick it long after his teammates have assumed attacking positions higher up the pitch. Under the current team mentality and fluidity instructions, the goalkeeper will focus on securely distributing the ball to defenders as soon as possible, though he will still kick it long if the defence finds itself under pressure. Under the current team mentality and fluidity instructions, the goalkeeper will focus on securely distributing the ball to the defence and helping them keep possession when under pressure from opposition forwards. Under the current team mentality and fluidity instructions, the goalkeeper will focus on quickly distributing the ball to facilitiate rapid counterattacks and offering a deep outlet for possession passes to help his team keep hold of the ball during elaborate build-up plays. Under the current team mentality and fluidity instructions, the goalkeeper will focus on quickly distributing the ball to open teammates across the pitch with a much greater willingness to leave his area to help sustain offensive pressure. My intention in creating the mentality ladder was to provide a more accessible foundation for understanding and utilizing the common concept to which these terms refer. Hopefully, if you were totally confused before, this guide has provided you with a greater degree of clarity and a useful tool for getting what you want out of your tactics. If you were already comfortable with the fluidity setting, then at the very least, I hope this guide has inspired a few ideas for using them in new and novel ways. However, as I said in the introduction, this guide is only an initial, exploratory attempt at outlining and clarifying the practical foundations of fluidity in terms of the ordinary language used between coach and player. While the mentality ladder is rooted in my experiences playing the game and testing various tactical settings within the confines of the Tactics Creator, it will undoubtedly need to be further adjusted and refined (certainly, it has already undergone multiple revisions prior to this initial publication). With that said, even in this early state, I hope it will prove to be an accessible and entertaining heuristic framework that will better enable you to avoid unnecessary guesswork and just have more fun with the game. Phew! I'm going to go drink some coffee now. Brilliant, simply brilliant and easily the best post I've ever read on here. Can i ask, how long did that take to write? i'll be reading this over the course of the next few months..
Omg, I think this is what people need! I am blown away! Whenever I start thinking I'm getting to grips with the tactical aspect I am brought back down to earth with a bang by articles like this. This will take some time to properly digest - I can't wait to apply this! Could you explain how you came about the tactical priorities of each position? Was it a case of interpreting the slider settings of each duty in the previous iteration? One useful addition could be the attacking roles in the AML/R strata - e.g. IF(a)/W(a), but as I understand it their main concern is just getting into the box. This is pretty much the book on mentality. Nothing further needs to be written. Absolutely stunning job! Masterpiece. The Louvre should just withdraw Da Vinci's Mona Lisa and expose this instead. Another point I am concerned with is that assigning duties in this way tends to lend your team to following specific patterns of play rather than fluidity based on the current situation. For example: it's easy for me to setup in a way that says "Advanced Forward, you move into channels and try to drag defenders with you to free up space for the Shadow Striker to surge into". However, real football is not based on one such example to create space - indeed, a manager may instruct the forward to act in multiple ways such as sitting on the shoulder of the last defender to create space in the hole in addition to the above depending on circumstance. If a defender is tightly marking him, he may choose movement to drag him out of position, and if they are defending deep and standing off he may use the space in the hole or use his physical presence close to them to pin them back. In each case, the way players act behind that forward would be different - the SS may become more of a playmaker temporarily while space is available to him. Sure, we as managers can change the player instruction of the forward if we see a specific tendency in the opposition defence emerge, but I find this tedious and unrealistic. The forward should have been instructed beforehand how to act in each circumstance, and in turn the players behind him based on how he acts. Thus the only approach I can think of to simulate autonomous movement in this way is increasing creative freedom - but as this seems to be a flair modifier more than anything else, and as you describe acts more to release the player from certain tactical priorities it won't necessarily do what you want it to. In this video an example is the movement of the #4 and #10 when the #4 is tightly marked (~2:00min). Simply clicking "More Roaming" does not simulate smart rotation in this way and I am not convinced implementing systems in this much detail is possible right now. Having read more into your post I believe creating a specific pattern of play is possible, but not specific patterns. This is one part where I believe the Rigid/Very Rigid systems break down - as you are relying on the system to carry you through games but you cannot implement that system in a way that does not rely on player intuition without becoming too one-dimensional. It just took me 2 hours to read, digest, and break it down into chunks within notepad capturing some key elements which I often overlook. Thank you for this outstanding post and the amount of work/thought that went into it. Do you have this work on pdf format by any chance? Im very interested in printing it so i can read it on the bus on my way to work. This is very well written! I question whether is making anything more accessible though. In fact I find it to be prone to over-analyzing here and there, over-analyzing what "under the hood" is in some cases rather basic game mechanics. That is no problem for the theorist, but it is sometimes implying crucial nuances of micro-control that aren't met by neither the tactical tools nor the match play in my opinion, possibly leading people to worry too much themselves. Theorems are fun, but remember the game was perfectly playable if people understood the basic implications of the most important settings (mentality/runs from deep being arguably those) long before. But as analyzing the match action has always been a bit subjective, and I have more recently questioned some of the "mentality frameworks" that form half the base behind the fluidities in the philosophy thread, you might see this differently. Don't get me wong, as a research, scientific and philosophy piece about the tactical instructions, it is a terrific read. As said, I just don't see it as something that will help people more easily get to grips with the implications of their choices. The length alone will prevent this, and some of the concepts like the "mentality ladder" are abstract in nature and reasonably complicated in an on itself. That is like putting another abstract layer on what already is an abstract layer (the fluidities), with the mechanical core often not providing the influences on match action that justifies either. There is a reason why SI themselves struggle to cover the fluidities in-game, as you also pointed out. wwfan's 12 step guide does provide quick understanding to a small degree, but often it is just giving basic guidelines without explaining their reasoning. For instance, it says it is advisable to have one "attack" duty player in defence and midfield, but it doesn't say why, for instance. If you know what the duties represent and how they're set up (a quick glance over the text descriptions should give you the vital clue), you'd know why such is advisable though. But it is what is is, and it delivers what it promises on the tin. This fully deserves to be featured prominently. This is for the advanced theorist, and those that like to theorize not only about about tactics and how they are implemented into FM, but analyze in every small nuance and detail the tools they're given – even if those theories won't necessarily manifest themselves much in the game itself, as the game in my opinion is in many cases much more simple than the theories it spawns. Some of those have made it officially into the game, the aforementioned handful of distinct (or not so distinct) mentality theorems in the form of the fluidites/philsophies. Still, it is those advanced theories that triggered a shift in development for SI, a crass one: abstract sliders and instructions that had been in the game for more than a decade have now been completely replaced. Not only that, but SI aren't limited to those anymore, as is evident if you watch the behavior of certain roles, such as the half back dropping in between the centre backs, something impossible to do with the instructions of old. That is progress, as firstly there was no such thing as a role in FM before, in the "worst case" a human player would give all his starters instructions that would best fit their attributes as he saw fit, individually. Tactics could be without coherence, shape, and form (they still can be to a big degree, naturally). And secondly, I'm personally convinced that it was those elaborate community efforts that had shown SI the game was more capable of doing than they thought it could. In that sense, again, thumbs up. But somewhere along those tricky lines, it mitht become easy to over-complicate too. I had an initial draft in November, but it had to be completely revised several times. Originally, I had a section discussing this, but I didn't want to draw too much attention to the sliders since I felt that would detract from the whole point of an FM14-friendly guide. The tactical priorities don't correspond directly to slider settings. They reflect the settings in terms of the broader logic of the TC's approach to assigning the settings which became apparent when I was first mapping out mentality structures for the initial draft (and was the first thing to prompt a major revision). In the mentality structure outlines, any role in the position will have the default tactical priority unless an exception is listed. I will try to make that a bit more clear when I have some time to revise the OP. I don't really know what to say about this thread other than, I am totally floored by it. Wow. Incredibly well done THOG, this is brilliance. Just brilliance. This is why I heavily emphasized the idea of tactical priorities being guidelines as opposed to emphatic demands that a player do X at all times. They're a point of reference intended to outline the most basic game plan in terms of something a manager would actually say to his players, but the idea of the mentality ladder as a whole was to illustrate how players do adapt. In broader terms, the problem with being too general is that you then have no real, practical idea as to what you're doing. This was the whole issue with the old settings anyway. What does "8" translate to? What does "attacking" even translate to, especially when you're talking about a centreback or defensive midfielder. Of course, the danger of this level of specificity is that it may create the impression of a restriction and that things are too mechanized. Ultimately, I decided the most accessible and realistic compromise in terms of translating a football game system to real world actions was to be very specific but to heavily qualify it with the idea that the point of reference is more of an anchor that guides and restrains the player's voyage through a very fluid bowl of tactics soup. To some extent, this gets to the unusual nature of the management genre itself. In most games, you have absolute control over the people on the screen. You control their every movement, and there is an assumption that what you command will be faithfully obeyed without question. However, a management game completely turns this on its head. The fundamental idea of the game is that you're asking someone you don't directly control to do something, and then you see how they actually go about doing it assuming they have the skill and intelligence needed to do it at all. Going back to what you were saying about modeling the autonomy and ingenuity of players in real life, representing actual coaching to that level of detail is a long way off in both technical and design terms. This requires that things operate in broad concepts, but at the same time, IMO, those concepts still have to be situated in something more specific to avoid the sense that you're just pressing unmarked buttons on a black box. I certainly understand where you're coming from, and it's fair to point out that not everyone is going to like this way of looking at things. I wouldn't throw this down at the feet of someone just starting the game, but I wouldn't say it's only for the advanced theorist. The mentality ladder itself is, admittedly, pretty far removed from actual tactical terminology, but it was intended as more of a corrective to previous ways of interpreting TC mechanisms. Ideally, it wouldn't be necessary to explain that player responsibilities respond dynamically to context, and certainly, you can argue that the same point could be made more intuitively. On the other hand, I think the idea of tactical priorities is reasonably accessible and not terribly worrisome as long as it's recognized as a general reference point or central tendency as opposed to a hard rule (which could be said for roles and nearly every other instruction as well). Beyond that, on its own, I think/hope section 7 would help even relatively new players clear up a lot of common misconceptions, and I think just looking at the mentality structure outlines should help a lot of newer players get a better sense of what a lot of the more general settings do. In that regard, this project was intended to serve two, somewhat separate purposes: a critical examination of the idea of fluidity in terms of its actual function and a more simple reference guide for figuring out who will generally be doing what on a specific mentality/fluidity combination. I think the latter should be of use even to those who have absolutely zero interest in the nuts & bolts, theoretical aspect. I would say, however, that I wouldn't expect a new player to read this and be a master football manager and I wouldn't bill this as a guide to playing football manager. Rather, it's a supplementary reference for those already playing it. What I hope, then, is that it will clear up misconceptions about specific settings and get people thinking about the settings in a way that reflects their actual function (and even if this goes, as you say, a bit too far under the hood at times, the way things work under the hood is still more like actual tactics than what many [myself included] often assume). Of course, ultimately, actually playing the game is the only way to really learn it, and to that extent, any guide will only be one curve in the hermeneutic circle. EDIT: After reading your comment a second time, I don't think there's really too much of an area of disagreement. In fact, one of the key points (as stated in the introduction) is that there isn't that much difference between the fluidity settings in terms of broadly defining the team's actual style of play. As I said, the differences are often imperceptible on the pitch unless you are focusing on very specific, fine details. The feature itself is a reflection of methods of micromanagement while the idea of the mentality ladder is to illustrate that all player behaviour is still highly dynamic and bound within a common framework. Moreover, even if you disregard that, the differences between the tactical priorities themselves are marginal and not at all reflective of the erroneous notion that moving one click on the mentality slider will massively disrupt the effectiveness of the tactic. Indirectly, this entire guide could be read as an extended argument against that misconception. So with that said, I suppose the main difference is that rather than say that fluidity doesn't matter because it doesn't have a massive, instantly recognizable effect, I see it as a tool for achieving specific effects (and indeed, it does that in practice). In terms of the game being playable for those who don't have any interest in the tactical aspect, I would never suggest otherwise and I hope that never ceases to be the case. Sorry, all I have at the moment is a lot of plain text covered in vBulletin code. Just seen this pop up as a sticky, and I just want to doff my hat and say, like I'm sure many others will, that this is just a simply stunning piece of work, and leaves me with my jaw hanging open. Yeah, you can tell, everything is presented crisp and effectively. Brevity is key. The sliderless era has a masterwork. That's basically amazing. Just wow. To echo what was said earlier; Mind. Blown. Mama mia! I solute the effort put into this. However, I can't help but think that this is too much explanation for a simple game, both in real life and as simulation. I read it all and I can honestly say that this raised more questions in my head than made things clear or understandable. So I rather not think about that at all and just keep playing FM. Always happy to read any thread with "framework" in the title. Admittedly I haven't read the whole piece yet, but the irony in what I have read is astounding. Discussing the "confusion and misconceptions" with the tactic creator but then going on with the business-jargon and deliberately excessive use of long words will massively see the majority of FM players bypassing this. But then maybe I'm not the target audience for this? Maybe I see FM as more of a game than a business case. Why bother with a comment like this? What does it add? Apart from sarcastic vitriol, that is. If you can think of a way to reduce the info into short nuggets that convey an equal ammount, why wouldn't you? And if your struggling with long words, the internet can always provide a dictionary. It's just interesting to see where people are taking the game. I'm studying for an ITIL qualification at the moment, so I get my fill of long words there. My point is that writing styles are prevalent throughout the forum for a reason (to keep the reader interested), maybe the author of this thread will see a rise in interest if the language wasn't just to appeal to a specific type of FM player/Forum Member. No doubt, the content is cracking but the application may be trying too hard to appeal to the higher level of forum member. This is an incredible, incredible post and on first read (many more are needed) certain things are already becoming clearer. I would also like to echo Sebaz's question and wonder if there is a PDF? The information certainly lends itself to multiple reads away from a PC screen. Edit: whoops, I see that question has already been answered. I appreciate and welcome the stylistic feedback. My goal in initially presenting this was to be as precise and exhaustive as possible in laying out my reasoning while carefully guarding against what I anticipated as potential misinterpretations. However, the heart of the project since its inception was always the tactical priorities which are, I believe, fairly simple and straight forward and, along with the mentality structure outlines, available here for players of any skill level to use as a quick way of determining what their players are likely to be focused on doing under a given setting. I certainly understand that a more general release version of this would need to cut this down to basics which is something I plan on doing, though I would add that developing the idea in this much detail was as much for my benefit as that of any potential reader. For what it's worth, I don't think he tried to show off or overcomplicate things at all, quite the opposite. We all work differently, and I'm the kind of person who wants theories and models for everything, rather than relying on anecdotal evidence or "try it and see if it works". Thus, for me it reinforced and formalized a lot of the concepts that I already sort of knew but couldn't really pin down. It has already helped me understand some of the aspects that've previously caused me confusion, so I'm pretty sure I'll have great use of this thread now and in the future. This is one more perfect example that proves the need of a total revamp of the descriptions of Instructions/Mentalities/Fluidity Settings. With the descriptions being so "vague", we end up with these (awesome) guides/frameworks in order to actually know what is going on when we use certain settings. Wow this is amazig. I signed up for this forum because I wanted some advice with my tactics & I certainly got it. I am going to have to start a new game and worth this through from the beginning. If it's OK I will likely post some practical examples later as I am sure I will need some advice!